A smiling face with heart shaped eyes and open mouth. No teeth are shown. 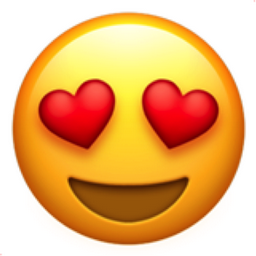 This emoji is wildly in love with someone or something. One look at the heart-shaped eyes says it all, this emoji is head over heals and madly in love with you. Happy face in love. old name: Face With Heart-Shaped Eyes. iEmoji old name: Lovestruck.